On Saturday November 17th 2012 we were at Coleman Hall which is located inside the Tanglewood Senior Center in Butler Pennsylvania. The event was a wedding reception for Richard and Sarah Lynch. 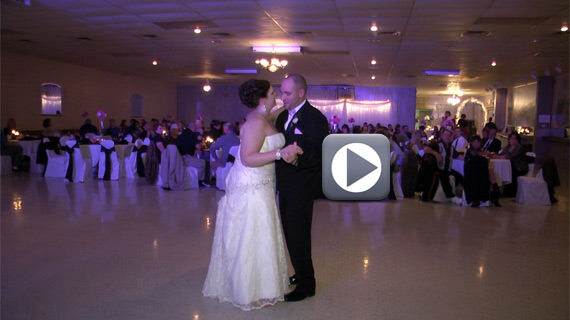 Sarah and Rich were married at 4:30 pm at Westminster Presbyterian Church on Main Street in Butler. Guests began arriving at Coleman Hall shortly before 5:30 pm where they enjoyed cocktails and appetizers as the bridal party posed for photographs with Tiffany Wolfe of Tiffany Wolfe Photography from New Castle PA.
At 6:30 pm we formally introduced the bridal party into the banquet hall and then guests enjoyed a wonderful meal that was served buffet style. After dinner guests danced to the sounds of DJ Pifemaster until the wedding reception ended at 10:30 pm.